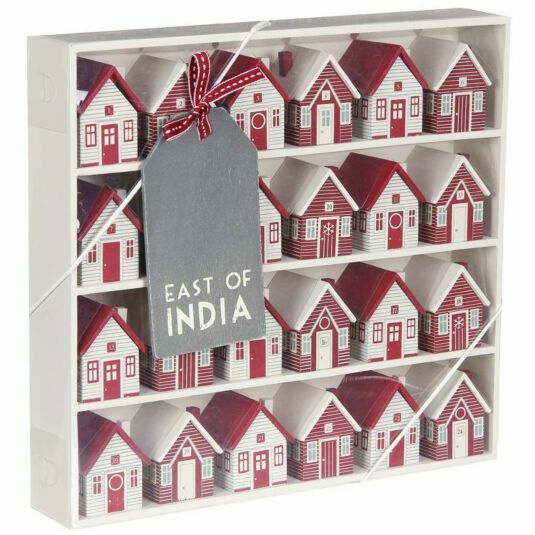 This charming Advent Village from East of India is perfect for a countdown to Christmas. Each house measures 1.8cm wide x 4.6cm deep, with a height of 5cm. Each one has a removable roof, with space inside the house for a small gift or wrapped sweet. The set is made up of 24 little wooden houses, painted in festive red and cream, with details in blue. The houses resemble wooden beach huts or clapboard cottages, and are numbered from 1 to 24, so you can put an extra special present inside the last one! Each has a tiny chimney, and doors and windows painted on. The Advent Village is presented in its own wooden display box, painted cream, with four shelves, and would also look beautiful on a shelf or mantelpiece. It makes a perfect festive centrepiece which will be brought out every year, becoming part of your Christmas tradition! Box dimensions: 32.5cm wide x 30cm high x 5.8cm deep.